From ancient history, mankind has had an ongoing love affair with all things marble. 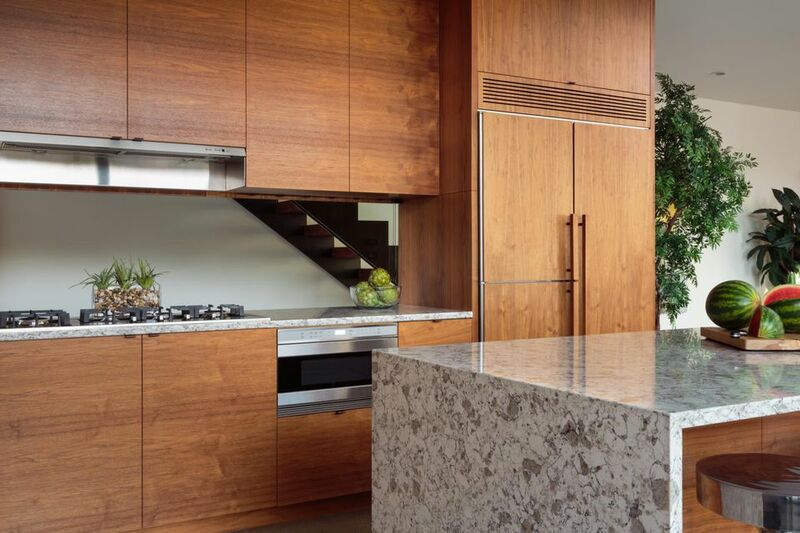 Why not in your kitchen in the form of kitchen countertops or bathroom vanity tops? Marble carries with it the weight of its legacy, but now owning it is no longer limited to the wealthy. Quarried slab marble--that is, the real stuff--is cheaper than in years past, due to more efficient extraction techniques and less expensive ocean-freighting costs. Also, you can buy cultured marble countertops (not quite the real stuff) that are more within the affordable range for the rest of us. And if seamless slab or cultured marble is not affordable, homeowners can always find a ready solution by using tiles instead. One of the best qualities of marble, as applied to countertops, is the variety of color and veining. Laminate and solid surface countertops (i.e., Formica or Corian brands, respectively) all attempt to reproduce the beauty of marble, yet nothing comes close to the three-dimensional depth and richness and veining of real stone. In fact, laminate's beauty is only skin deep. Just below its photographic and wear layers is nothing but particle board. By contrast, marble is marble, from top to bottom. Marble is a metamorphic rock, which means it changes from its original, sedimentary form (in this case, limestone or dolomite rock) to marble under severe pressure and heat. This means that marble's distinguishing feature--the veining--is the result of impurities in the original limestone. Under extreme pressure and heat, the original materials completely re-crystallize. The purest marble is white, the type that Renaissance artists carved into statues. Marble counters stain, do they ever. We're not just talking about obvious culprits like prune juice and tomatoes, either. Homeowners who have installed real slab marble report, with dismay, that their counters stain even when water sits on it too long. One homeowner even suggests taking a Myers-Briggs Personality Test to confirm that you value beauty and aesthetics above any shred of practicality and reason. If so, she says, then go ahead and buy that marble counter. So Is Cultured Stone a Solution? If you want the look but not the price and maintenance, a viable and cost-effective avenue is the cultured marble countertop. Crushed marble is combined with thermoplastic resin and molded into slabs. Why so low-maintenance, though. Because unlike natural marble, the resins in cultured marble lend non-porosity to the material. Cultured stone still can stain, but staining is far less likely to happen. Cultured marble countertops have a gloss or flat finish, and can come with integral sinks or allow for a drop-in sink. Can you DIY-install a cultured marble counter? Not easily. Fabrication of both natural and cultured stone is best left in the hands of professionals. Fancy Details: Marble countertops can be fabricated to have fancy ogee edges (as well as other profile styles), due to the softness and overall workability of marble. Cutting: If you've worked with marble tiles, for instance, they cut easier than granite, which is prone to chip more easily. Marble cuts like a dream. This allows for fancier design capabilities without the fear of damage, relative to other types of stone. Decent Durability: Even with marble's inherent "softness," it is still hard enough to withstand high traffic. Resists Heat: It's an ideal work surface. It is also heat resistance, lending itself well to kitchen use. Scratches: Scratches tend to be more of an issue with polished marble. As a natural mineral, there are varieties of marble with varying degrees of hardness, but scratches are a pretty common concern, particularly in kitchen applications. Stains: This one bears repeating. Due to its softness or porosity, it is also more of a pain to service since it just loves to stain. Certain foods, especially on the acidic side, can result in permanent stains. Sealing the marble countertop and keeping up with sealing on a regular (usually annual, though more frequent if you are an avid cook) helps mitigate staining. Repairs: Repairs on marble countertops are not simple unless the countertop is marble tile. In the case of marble tiles, you simply replace the damaged tile. Replacing a marble tile individually--without affecting surrounding tiles--is a painstaking task that you may want to leave in the hands of professional tile installers. The good news is that the cost of replacing one or two tiles is minimal.